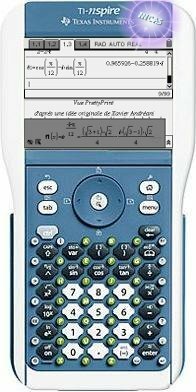 Thus, Critor made this to broaden the popularity of the TI-nSpire nonCAS, cause poor students sale their useless calc and buy a Casio calc..
Well, this pretty useful stuff is called "mCAS" like "mini CAS". In its description, you can learn that the TI-nSpire nonCAS have only one CAS engine ( / 4 on CAS) : the pretty print entry view. So then, when Critor told me "Hey, look at the functions, you can still have Pretty Print on it !" I designed a stupid but ingenious function that update the function box, and then you can view the result in Pretty Print on the TI-nSpire non CAS ! You still do not understand what does it mean ? Thank you Levak for this topic. For the moment, mCAS can only handle special expressions, more precisely 20 kinds of special expressions. But that's far enough for the students here. It just takes some seconds in the worst cases. The next step would be to add arbitrary symbolics. With mCAS, you can do CAS-stuff on your basic TI-Nspire. The next mCAS library release is going to add a limit function to the non-CAS Nspire, and severall sample-tns using it to study functions and gathering the results in a tablea (matrix). Feel free to post your comments, needs and wishes. Hi I'm confused so how is MCAS supposed to help? I installed it but I'm a little confused about its benefits. I tried but it can't do any of these functions. It depends of what you want to do. mCAS currently does not support formal expressions. The released version gives you exact numeric results (with fractions, radicals and much more...). In the current development version, I'm adding limit support. For handling formal expressions, you may try a library from Bwang. © Copyright 2000-2019 Cemetech & Christopher Mitchell :: Page Execution Time: 0.110339 seconds.